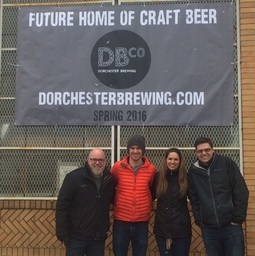 As we mentioned back in November, we were officially approved to move forward by the City of Boston Zoning folks. What that means is that we are now major construction zone with upwards of 25 people a day working at the property. 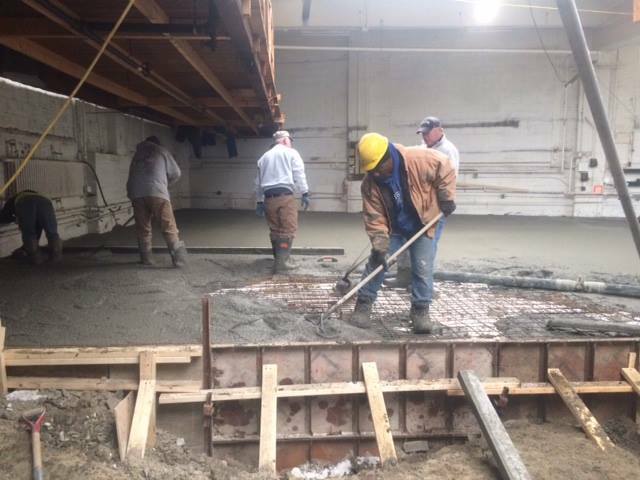 We’re currently working on the building improvements, including structural flooring for the contract/partner brewery (2 brew houses and 20+ 60 bbl tanks weigh a lot when full), windows, four bathrooms, walls, two tasting rooms to celebrate our contract brewing partners as well as putting up a nearly 3-story tall grain silo in the front right side of the building, which should go up around the 3rd week of March. We think it’s the first silo ever to be erected in Dorchester since the early 1800s. This, along with some sweet metal signage, will completely transform the outside of the building, so you won’t be able to miss us when you drive by. 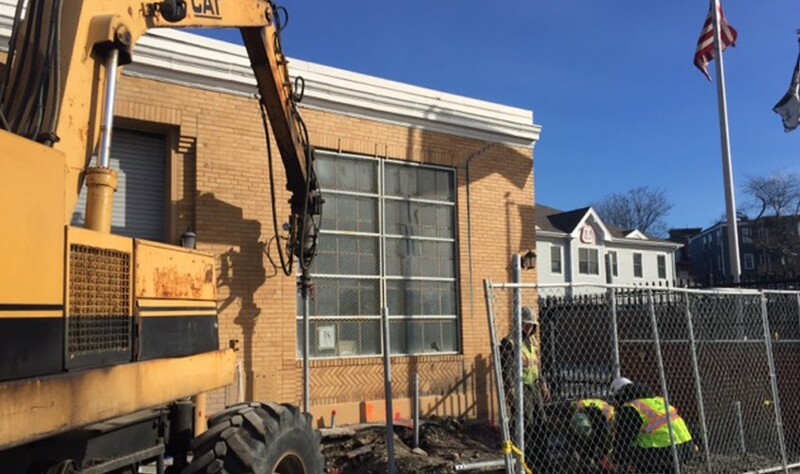 Check out some video footage of the construction progress taken from our good friend at Roscoe Studio– it feels great to have so much local support for our project! In addition to the construction of the building, we’re also in the midst of building out the brewery itself and recently received our TTB approval (which only took about 3 months). Nearly all of the equipment has been ordered and should arrive mid Spring. 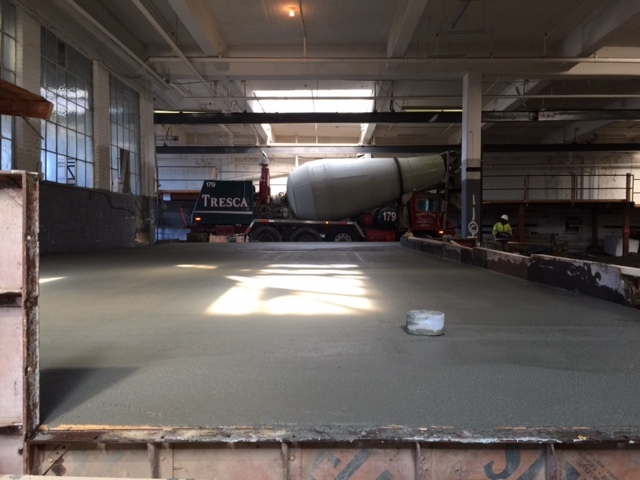 The first 60BBL fermenters and brite tanks should start to arrive mid to late March. Believe it or not, they are being delivered by FedEx. We’re all really excited about the high-quality, state-of-the art equipment that’s on order….High speed canning, bottling, kegging, an incredible NSI brewhouse. In fact, we will be one of only about 5 people to have the new Cask X2 canning system in North America. It’s been really amazing going through the process to source the best of the best for our future contract brewing partners. Lastly, and most importantly to some beer drinkers, we’re also working on the design and installation of our 2 tasting rooms. The tasting rooms will feature five to six collaboration beers our brewers will create, but most importantly, the other 14+ taps will showcase our contract and partner brewing partners and THEIR beers – you can expect tap takeovers, cool launch parties and fresh beer nights on a regular basis. 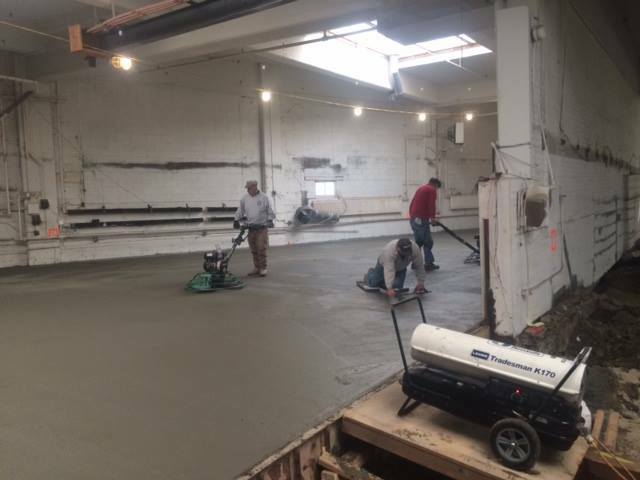 We’re giving our contract brewers a brick and mortar place they can call their own (at no additional cost BTW). 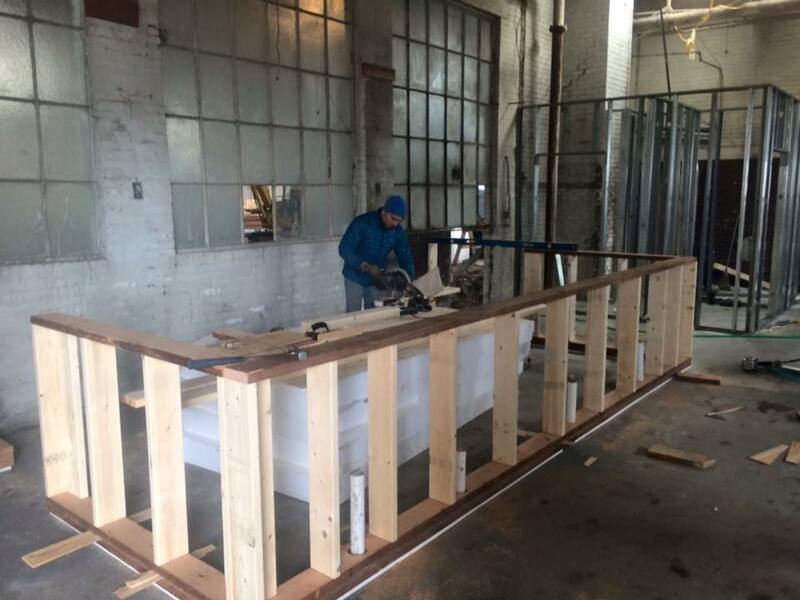 As we mentioned in the past, we’re going to have a really beautiful tasting bar with a 20-tap system (Perlick), so now we get to do all of the fun stuff like pick out the materials for the tasting bar and build our tables (both are being made by a local Dorchester artist and Matt, our CEO, from old Fir wood that is being milled onsite from the original building). We also get to rebuild and refinish the two inch factory wood flooring that has been there since the 50’s (kickass), select bar stools and lighting fixtures. We’re keeping as much of the original charm and character from the 1920’s factory. The old wire windows alone are epic. Can you tell we’re really excited about the tasting space?! With all of that said, you can imagine we’ve been pretty busy. Last question you might have – when will we open our doors? 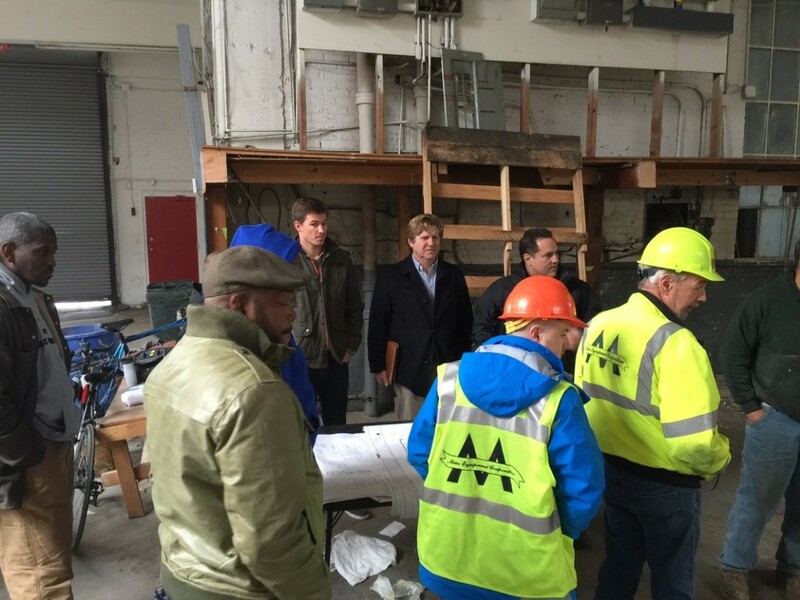 We’re working as quickly as can be and planning for a first contract brew in April with a May 2016 tasting room opening. We’ll keep you posted with our progress as the months go by. We are also now in talks with regional breweries about partnering together to make their beer and we are currently still accepting contract clients, so please contact us with any questions or if you are interested in working together. Be sure to follow us on Facebook and Twitter and join our email list so you can be invited to our opening celebration where we will all drink the first beer to be made at the brewery. Cheers!